Astrologer’s disclaimer— I do not have the verified birth time for Bernie Sanders, so this analysis may have timing issues. When we have the exact birth time, we have terrific results for accuracy. So here goes. Bernie Sanders is riding the Virgo wave that brought in a large group this primary season: Fiorina, Carson, Christie and Sanders, all Virgos. Virgos are not a common sign for a U.S. president; we had Taft and LB Johnson. Yet with Jupiter (the planet of good fortune) in Virgo until September, our optimism and interest has been piqued. 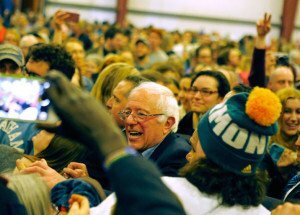 Sanders alone continues to surf the buoyant promise; let’s look at why. Virgos are naturally geared towards service and are usually more concerned with matters at hand than lofty ideas. They like to see results and roll up their sleeves instead of waiting for help. Yet Sanders has a Sun/Jupiter configuration which indicates his big picture concepts. He also has the North Node (destiny point) in Virgo with Neptune (symbolizing dreams, spirituality, creativity). This amplifies his idealism and allegiance to his causes. 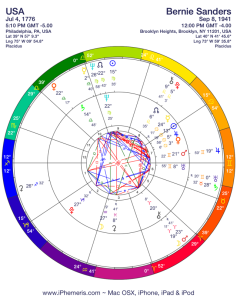 During the 1960s, when Uranus (the Great Awakener, planet of revolution and change) and Pluto (god of Death and irrevocable transformation) were both in the sign of Virgo, they galvanized his Virgo Sun, Node and Neptune. Sanders protested for civil rights and eventually went to Israel to spend a year on a kibbutz in service. When he returned, he settled in Vermont, a harbor for people who want to live closer to nature and cooperatively with their neighbors. Billboards are forbidden— not something Sanders orchestrated, but it gives you an idea how the Green Mountain state thinks. Without the birth time, it’s impossible to know the exact degree of the Moon, but since Uranus is in the sign of Aries, it’s fair to say that this can electrify him. Whether that’s already happened or is upcoming, time will tell. The Moon sign indicates what triggers the emotional weathervane for the individual. Sanders’ Moon is in the sign of Aries, fiery, single-minded and chock full of desire. It’s highly likely that Mars (symbolizing passion, self-assertion and anger) was close in line to that moon when he was born. 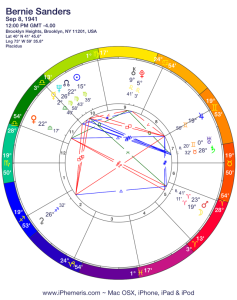 A Moon/Mars person does not like to lose and yet Sanders walks that tightrope with a bit more grace because Venus (planet of love, relating) is in direct opposition to the Mars. If he’s too sharp, he will retract; if he bows to compromise, he will demand his priority. This must have been much more stressful when he was young, but we see a man in the sage stage of his life. Ideally, he is a master of himself. Aries Moons are not known for their ability to compromise or to defer. Both eclipses in March may affect Sanders and throw light on to his ability to negotiate and bring about the revolution that his followers want. I find it unlikely that Sanders would capitulate if he seems to be losing the Democratic Party. It is true that Virgos serve, but an Aries Moon likes to do things their way. Even though a third party has never won the presidency, Sanders may feel he has no other choice. The March 8 Solar Eclipse triggers his natal Jupiter as well as his Sun. This may indicate that light is shown on his policies, especially education and world relations. There may also be an emphasis on religion— perhaps brought about by pundits or polls. The Lunar Eclipse on March 23 engages his natal Mercury. This is an extremely volatile time for Sanders and tests his temperament when debated or baited. Donald Trump will probably be swinging as well. When Sanders’ horoscope is put with the chart of the U.S.A., there are a few fascinating connections. One is that his Neptune/North Node, the destiny point that indicates a spiritual mandate to heal is on the U.S.A. Neptune. Americans have a challenge with this as a country; there is a proud identity to help, but there’s also the rugged individualist myth of do it on your own. Sanders also has Chiron (symbolizing the Wounded Healer) and Pluto on the U.S.A. North Node— he is the voice of the future, to survive our country needs to truly understand its Cancer Sun roots. Very few people have actually read the Constitution or the Declaration of Independence. Our nation has raised generations of people who do not fully grasp their own history. So the pride they carry is false pride and Sanders beats the drum to bring power back to the people who originally revolted against the king and taxation without representation. When corporations are viewed as having the rights of a citizen, the people have lost fair representation. The last point I will mention at this time is his Mars/Moon on the U.S.A. Chiron. He is the longest serving Independent member of Congress and he feels the wound of the U.S. personally. He recognizes that until we heal old wounds, we will continue to be at the mercy of our Shadow. Using a noon time for Sanders, we can see that transiting Jupiter, 18° Virgo as I write this, is moving towards his Sun. Jupiter returns to this point in early April and passes it one last time once its gone direct in June. As it makes its last pass through Virgo, it continues to ramp up his popularity. The other factor to consider is that Saturn (symbolizing limitations, responsibility and fear) is in Sagittarius. This is in a point of tension with Jupiter as well, which can dampen the enthusiasm. The Virgo Sun shines with a healthy routine, but with his natural Sun/Jupiter picture, Sanders may have a tendency to overextend. How he paces himself over spring/summer is essential for the long race. Regardless of the outcome, “feel the Bern” is a great fit for an Aries Moon/Mars, don’t you think?